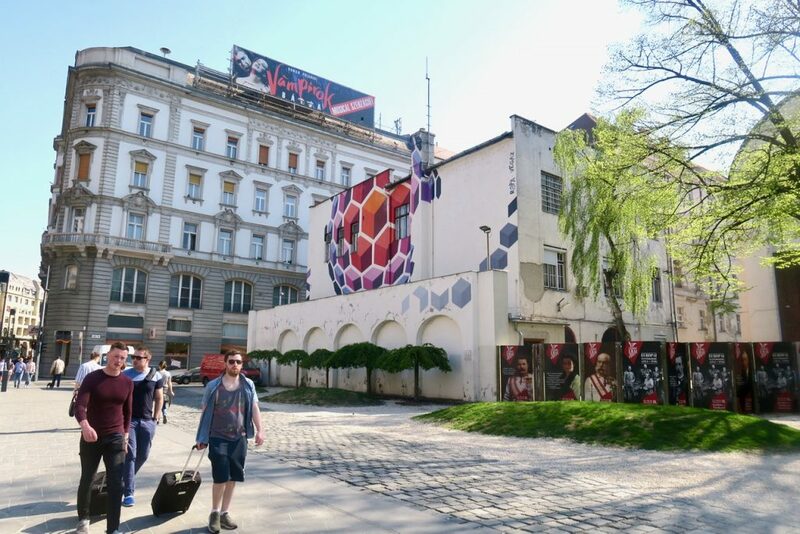 Our original intention was to meet with the Budapest Alternative Walking Tour on day one of our trip, however not adverse to going off plan (and getting too distracted by the pretty sights along the Danube) we missed our departure time. Thankfully, however, the group unlike many other tour operators still took groups on a Sunday, so we had a second chance to see the city’s alternative sights. To be honest I didn’t think I enjoyed tours until we went on the Alternative Walking Tour in Berlin last summer. Though I love learning and exploring, any tour I had been on previously seemed stuffy and too forced for my liking. 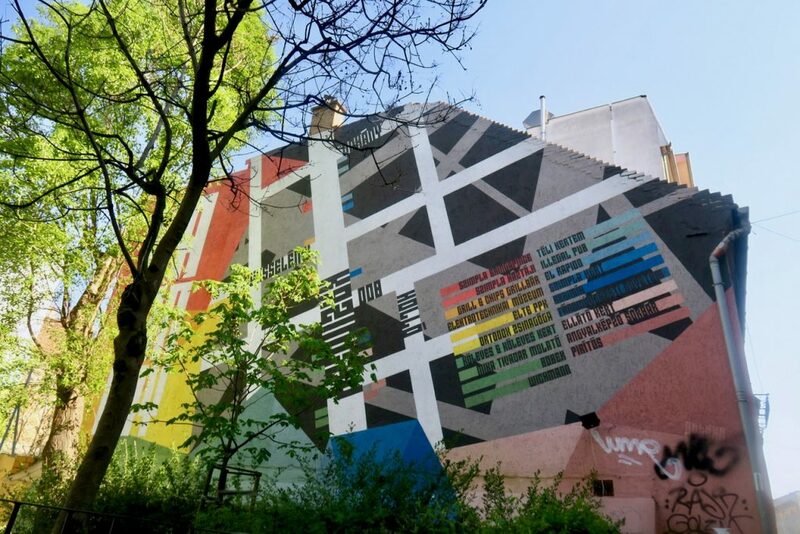 That’s why for years I decided to be my own guide of with the help of travel blogs, but having such a great experience on our alternative tour last year I was looking forward to seeing what The Free Original Budapest Alternative Tour had to offer. Meeting outside Starbucks at busy thoroughfare Deak Fenerc, we met with two guides. Lingering for a while it was obvious that we were the only takers for the day so Alejandro volunteered to take us solo. 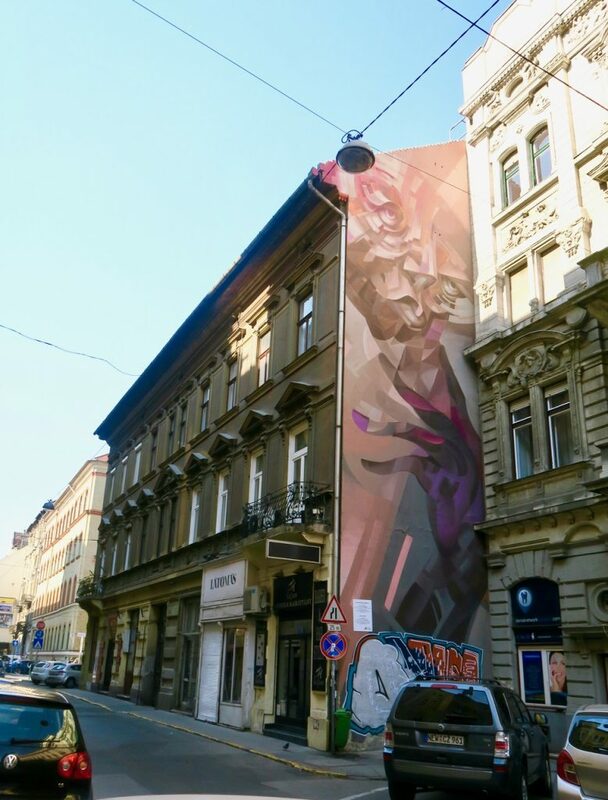 Starting out at Karoly Krt, Alejandro explained to us that this was the first mural to be painted in 2013 as part of a project on cooperation with Neopaint Works, a Budapest born art collective. 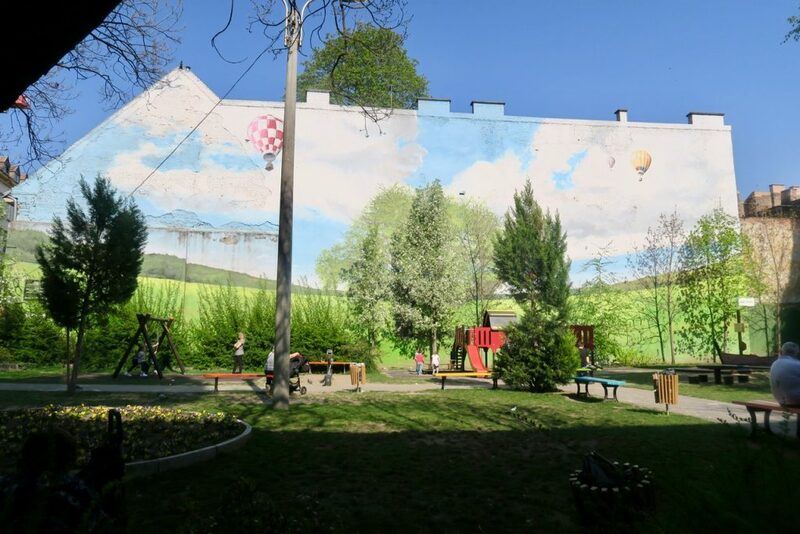 Once people saw the beauty that these colourful pieces brought to a once rundown area they grew in popularity and spread throughout the downtown. 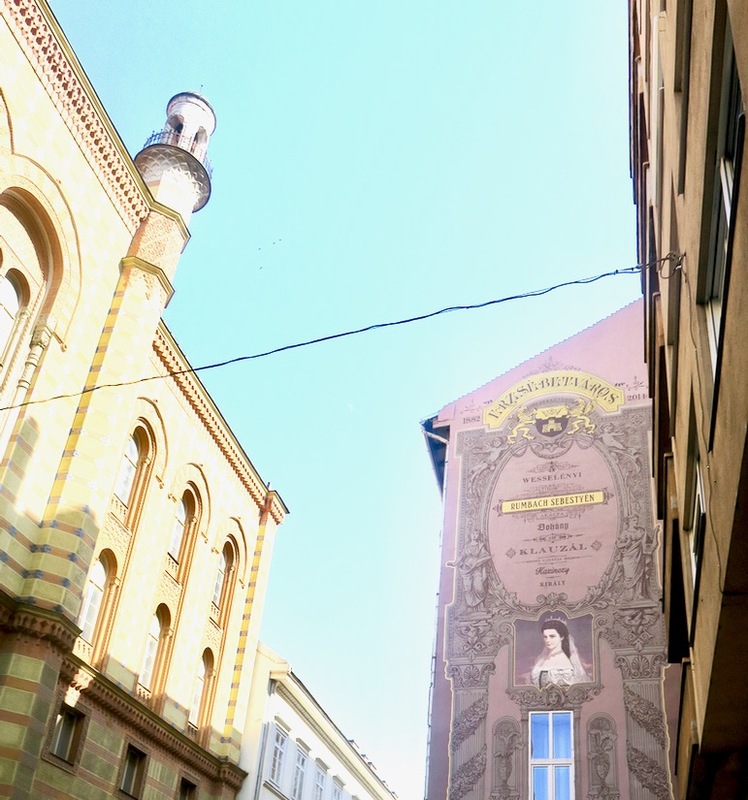 Moving on we stopped outside the Rumbach Street Synagogue to see a mural depicting Queen Elizabeth, the wife of Franz Joseph; the mural says Erzsébetváros meaning Elizabeth town and also has the street names of the district’s center as a handy painted guide. 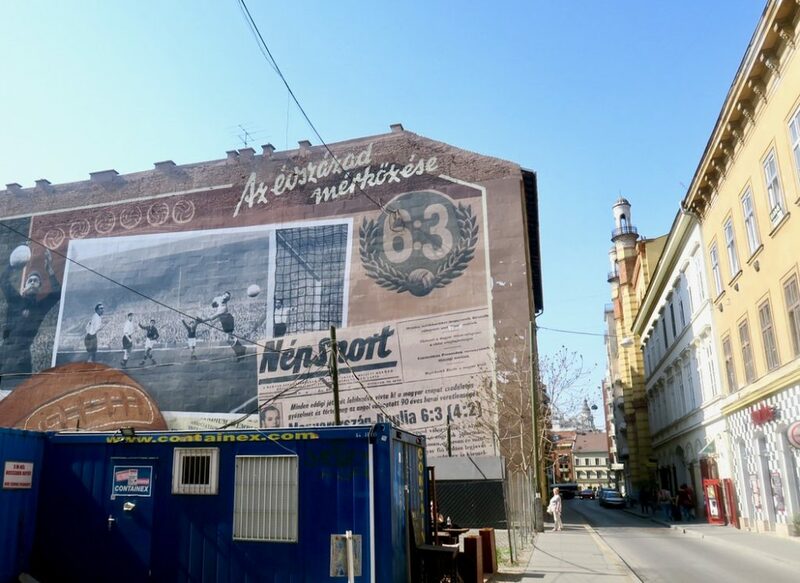 A little further up the street we moved onto two huge murals the first was a mega painting taking up 1000 square-meter surface depicting The Golden Team who beat England 6:3 at football in 1953 – so maybe not one for avid England fans. 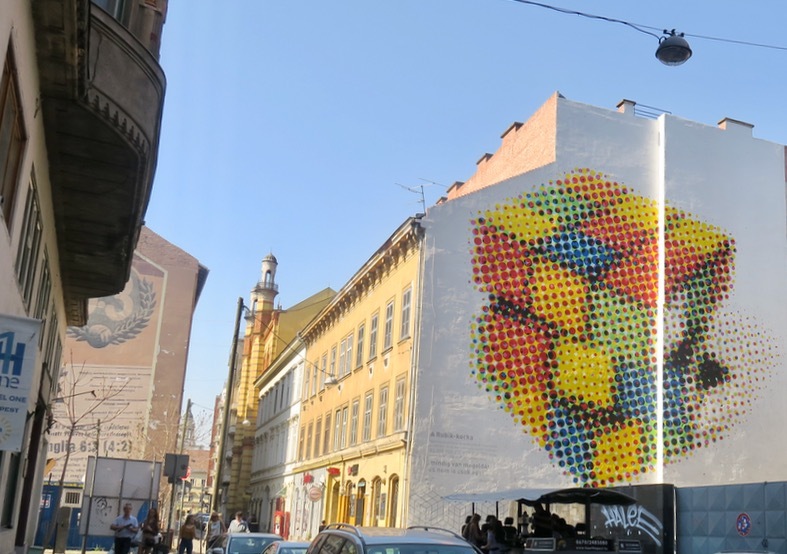 Across the street was a mural dedicated to the Rubik Cube. The famous puzzle was created by 1974 by Hungarian architect Ernő Rubikto. This piece is almost like a puzzle in itself, made up of small interconnecting circles that blur together to create a clear 3D image. 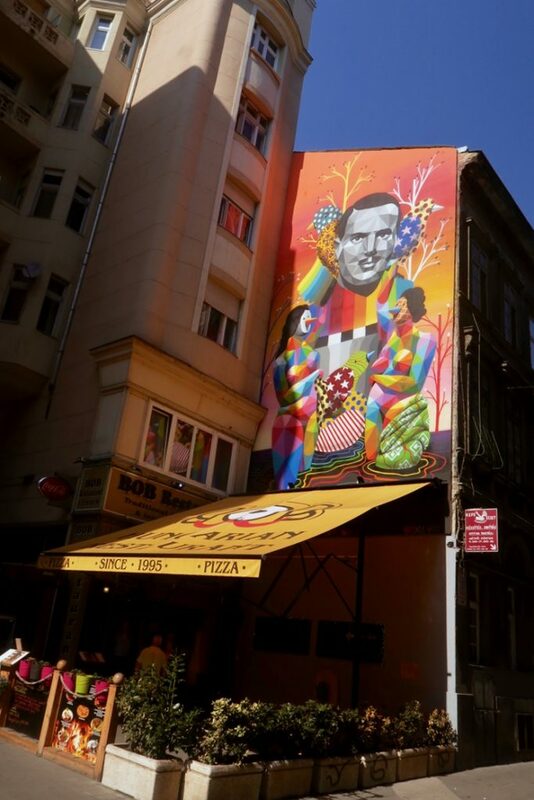 Wandering the streets there were many colourful murals from artists around the world. Strolling past some of the city’s famous ruin bars, more murals peaked out from the partially crumbling, yet beautiful, buildings. 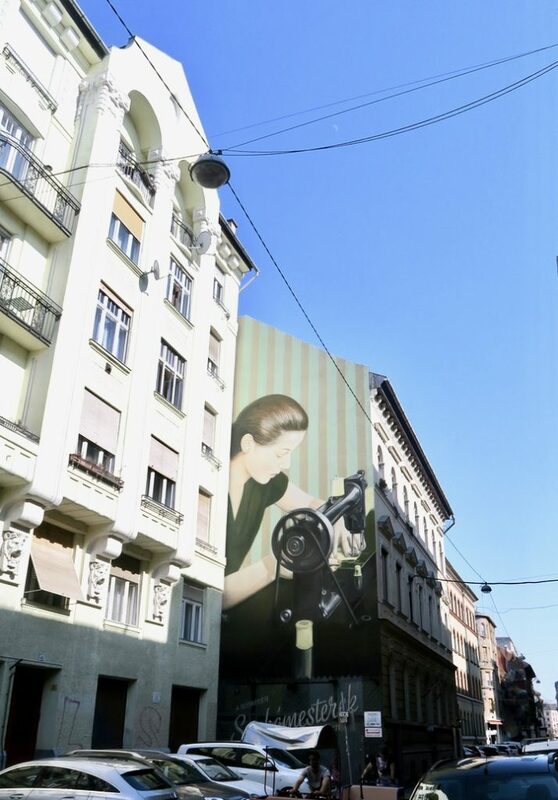 Some represented Budapest’s history – like this seamstress – and others represented the present, like the bike mural (which is comically placed directly opposite where people have to pay for car fines). 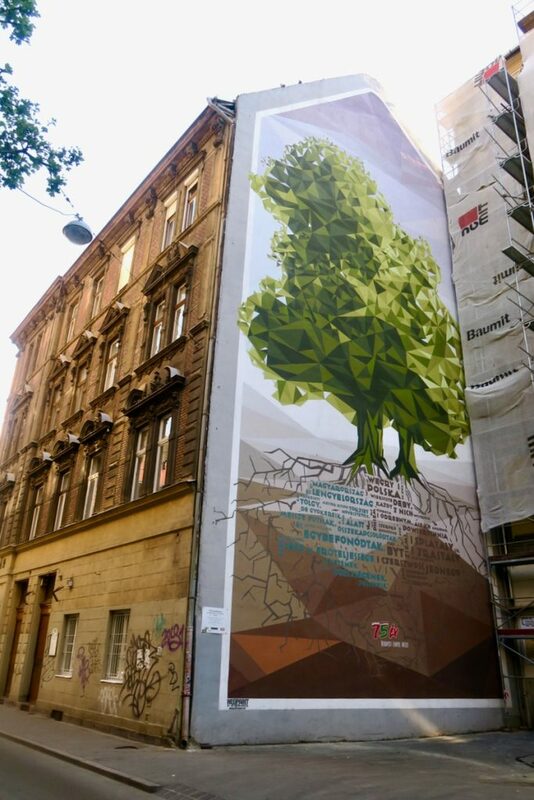 One painting that conveys both now and then is the Polish-Hungarian Friendship Tree showing that though these countries have different roots yet they are the same. 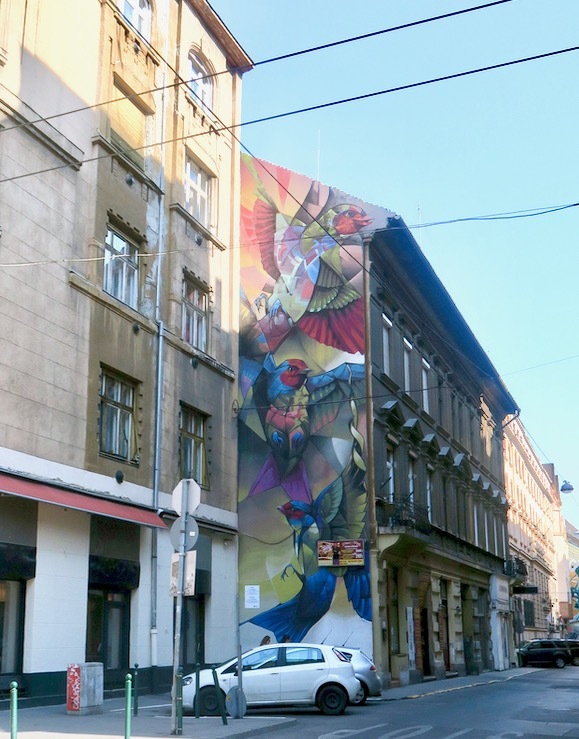 Another mural showing the city’s relationship is this piece by Dávid Tripsánszki and Dorka Jakócs. 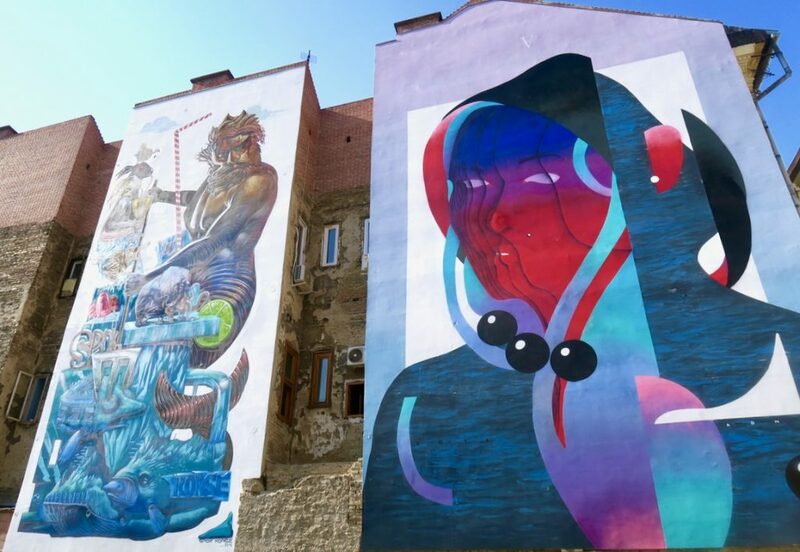 A male and female figure represent both sides of Budapest, unifying as one and brought together by the message “Everybody has a city”. 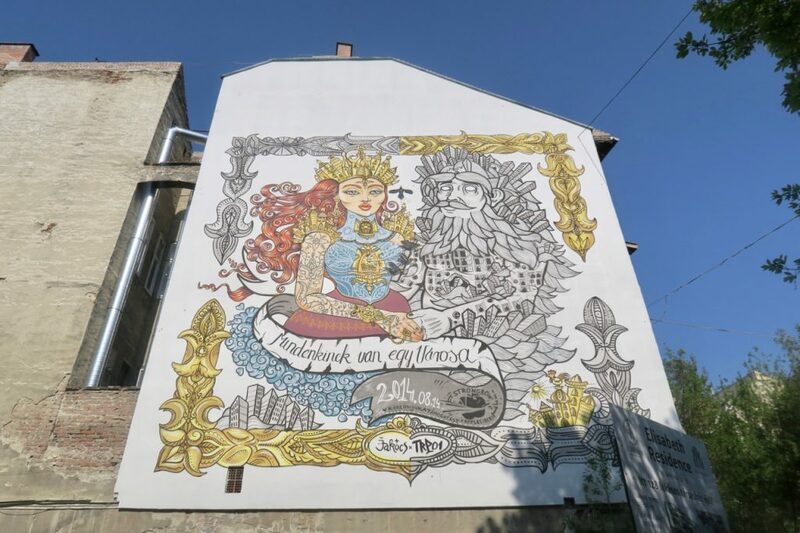 Many of the murals we admired in the second hour of the tour were created as part of the Színes Város Festival, where 13 street artists (who are mainly from Hungary) created new pieces of art throughout the downtown area of the city. 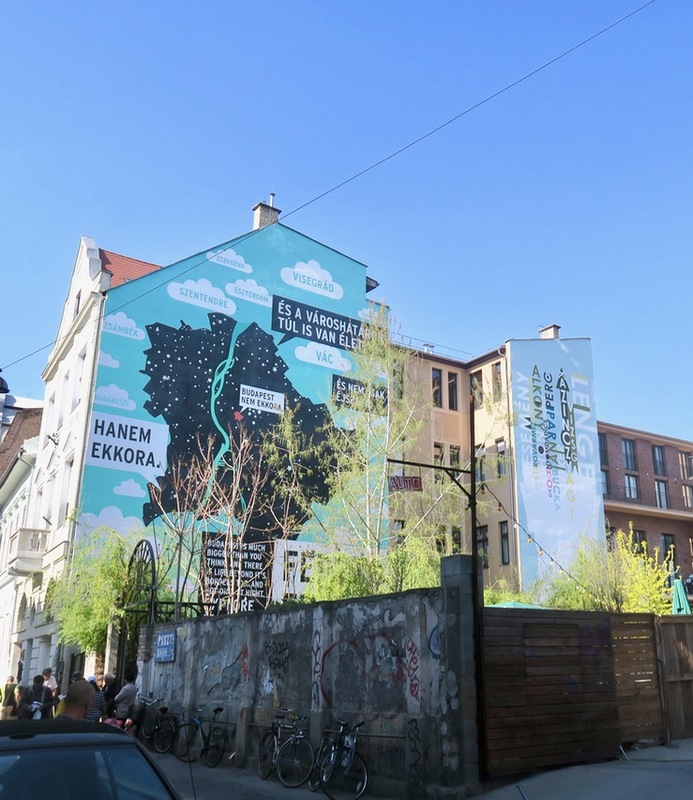 Though some of the art was collaborative there was a competitive element to the festival and the artists also competed with each other; the grand jury prize was awarded to Richárd Orosz for his work on Kertész Street, “Countryside, or City”. Some of my personal favourites from this collection included Chill or Rampage by Polish street and tattoo artist, Lukas Berger. “Sunrise, or Sunset” by Péter Szabó-Lencz is a map that is not only beautiful but super handy for if your phone battery dies. Heading back towards our Airbnb apartment Alejandro pointed out a few more vibrant murals, including this one which magnifies this small city park. Alejandro was a great guide, not only being knowledgeable and passionate about art and the area but was also a really cool guy to hang out with for a couple of hours. We enjoyed our time so much that we headed back to Ruin bar Szimpla Kert for a beer and to continue our conversation. Though the tour is advertised as free you are of course encouraged to tip if you feel it was of value. We gave our guide £10 each, which was honestly a bargain for such a great tour of Budapest’s murals and alternative scene. 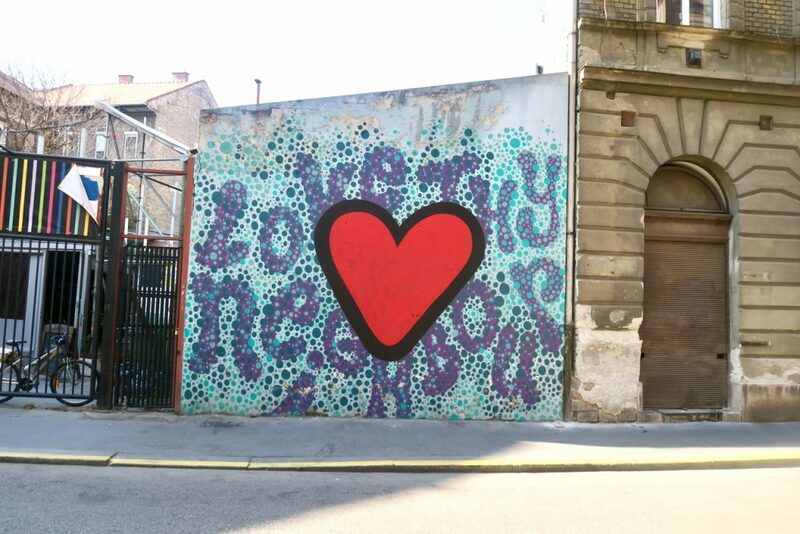 I reeeeally want to go back to Budapest and explore it more. The tour sounds fab!